Monday 19th - Sunday 25th March 2012 : Ambushed By Zulus ! 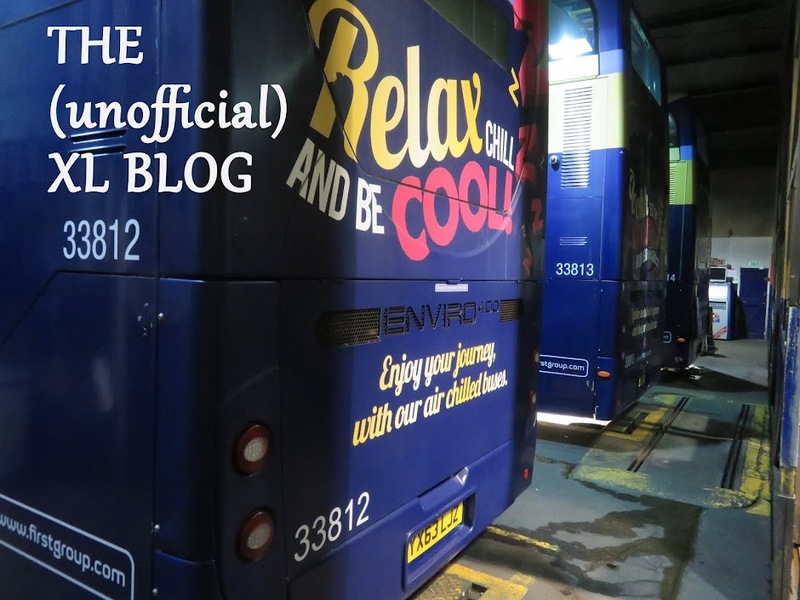 The B9 Geminis fit neatly over the inspection pits at King's Lynn garage, but the buses allegedly destined to replace them will be too long and will need to be turned to allow a full inspection. We will see ! We begin with a correction. Last Monday it was 20126 which worked L11 to Lynn for 37158 forward. This was due to 37565 being broken at Lowestoft with a starter motor fault. Today 37565 started out on K5 but it was replaced for the 10.32 Lynn - Lowestoft by 37566. Then 37156 on L11 continued its unreliable streak and 37565 having been taken off K5 took this to Peterborough at 10.45 departing 17 late. 37572 is stopped for MOT work this week. Malcolm saw 34155 on the 15.03 Lowestoft - Norwich X2. 37156 on K18 was once again swapped, this time for 37157. Malcolm had seen 37156 at Norwich when it was running 20 late. 37573 was spare at King's Lynn today after servicing. The Southgates webcam sprang into life again today which was convenient. 37567/574 were stopped at Lynn today, but there were no diagram swaps recorded. Traffic was particularly congested in King's Lynn mid-morning and 37564 on L12 was 12 late in and 11 late departing to Peterborough. At lunchtime 37159 on L10 was seen passing the Southgates coming in from Peterborough at 13.08 - about 20 late. It turned out to be a beautiful Spring day. K17 13.45 King's Lynn to Peterborough gets away from Terrington St. John with 37579 running 9 minutes late. 37156 has now gained adverts after its initial all white incarnation. Seen here in Vancouver Avenue this evening. 37572 had its MOT today so should be available tomorrow. Other stopped vehicles today were 37568 & 37577. 37564 arrives in Wisbech on K15 this lunchtime. I wish they would move that security camera which blights all pictures taken at this point ! An eventful day with breakdowns and late running. 37573 was in trouble early on with Y6 when it expired at Middleton in a cloud of black smoke. It was nothing serious, but 37567 took over the turn before 37573 was able to resume at 11.02 to Lowestoft. My friend John from Scotland planned to catch L11 12.05 ex Peterborough - it arrived at the railway station with 37157 precisely 30 minutes late. A lady of a certain age who was bound for Norwich interrogated the driver in rather pompous fashion at the bus station. "Why are you late" she demanded , "We were ambushed by Zulus" responded the driver in jocular fashion before explaining the real reason. "It is important to me that I arrive in Norwich on time" she continued. Now surely anyone with any sense who wanted to get to Norwich quickly from Peterborough would catch the train ? Ah but that would involve spending money I suppose. Her chances weren't improved when L11 arrived back in Wisbech 43 late en route eastbound. A collapsed manhole cover at Thorney Toll (again) was responsible for the long delays. 37564 was seen arriving in Wisbech about 10 late on K15 (See picture above) , this had begun the day with 37568. Malcolm says "Things were bad on the X1 at this end today, 37568 arrived 30 late on K15 and departed 25 late. Next was 37565 on K16 which came in 28 late and went out 22 late. 37156 had started at Lynn on K16, but presumably it was overtaken by 37565. 37156 turned up at Lowestoft in the path of K17 6 late. The afternoon saw 37575 collapse at Swaffham with a seized brake caliper on K2 at just after 3pm. Fitters were called and this was soon rectified with 575 being back on the road by evening. There were many swaps of course and I'm still not sure exactly what happened. Meanwhile, Palatine 34155 was out on the X2 seen arriving at Lowestoft with the 09.10 ex Norwich. 37159 departs from Walpole Highway this morning on K3 09.06 to Lowestoft. There were problems at lunchtime. I followed 37567 into Lynn from Peterborough at 12.20. I assumed this was to be L9 12.32 to Lowestoft, but while I was waiting for a friend at Lynn railway station, firstly 37567 passed by 'not in service' at 12.36. a minute later it was followed by 37563 also apparently 'not in service' but full of passengers and then at 12.38 37570 showing X1 Lowestoft with a few passengers on board. I think 37567 had a cracked screen and 37570 replaced it. 37563 had arrived on Y13 and this went west with 37575 and 37563 then returned east 30 late on L8 but had made this up by evening. Cheryl saw 37574 departing from Wisbech on the 11.22 to Peterborough, but it promptly blew up on the Horsefair roundabout with a complete loss of gears, a fitter had to attend and 37566 was wheeled out from Lynn to replace it for the 13.35 to Lowestoft. Otherwise a good day with just a few delays reported. A few mysteries this week - may be you can solve them ? 20126 was spotted at Necton heading east driven by Lynn fitter Colin at 11.30. I've been unable to find out why, but hope to do so eventually ! Otherwise an unremarkable day by all accounts. 37565 was changed for 37158 on L11 at Lynn. Amongst sightings from Malcolm on the X2 were 32656 on the 10.38, Palatine 34155 on the 12.40 ex Norwich and 30889 on the 13.40. One swap today, L8 began with 37579 and 37563 replaced it this morning. All the more surprising that was all, because Wisbech became a virtually no-go area. A water main leak at Weasenham Lane, plus Lynn Road closed eastbound due to a gas leak as well as the other roadworks. Ironically, Nene Quay has reopened to westbound traffic, but X1s are still diverted due to the Weasenham Lane temporary lights. 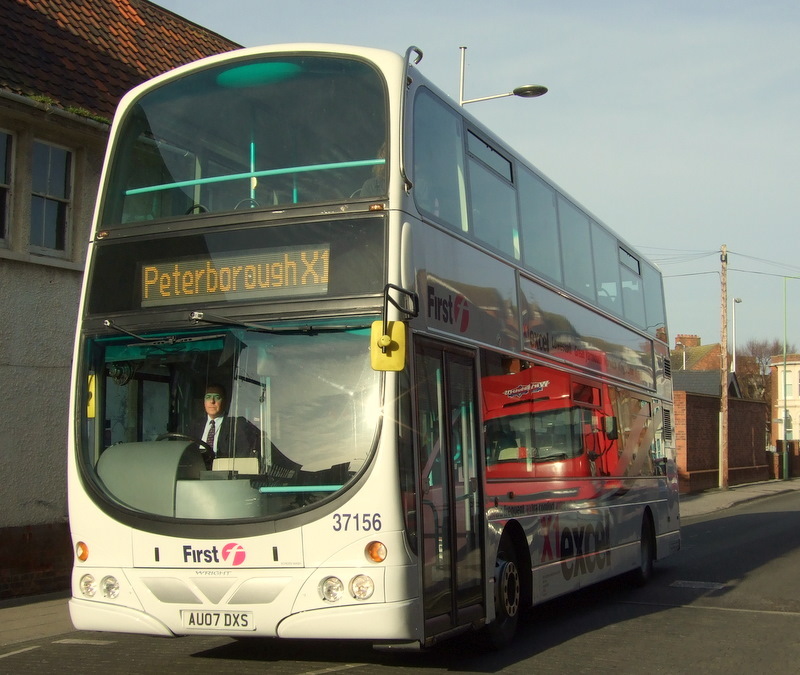 This morning I met 37160 on Norwich Road heading out of town on K3 08.56 Wisbech - Lowestoft. It was only slightly late and then took a further diversion down Clarkson Avenue to meet its booked route on Lynn Road by the Clarkson pub. The low tree branches in Clarkson Avenue must have been a bit of a challenge ! 37566 on Y6 08.15 ex King's Lynn was on time past Bruce, but due to the congestion was 29 late arriving at the Horsefair where Cheryl got on. When she alighted at Thorney, 37572 on Y7 was about a minute behind it. Rob H says " I took the 10.18 Wisbech - Peterborough this morning (Y9 in your parlance) and sat on the upper deck of 37577. Two guys who were already on board were creating a Tandoori atmosphere and as we approached Thorney Toll, one of them went to press the stop bell. This he did after we had passed the bus stop in an abortive effort to get the bus to stop outside the Little India restaurant. After a couple more presses on the bell and going downstairs, they eventually alighted at Thorney School much to the amusement of the other passengers. Here they crossed the road to wait for 37579 back eastbound. As I left the bus, I cheekily asked the driver whether he had managed to sell them a Thorney Toll to Thorney return, which he tactfully refused to let on. They had, as I suspected, been hoping for a request stop though - come on guys, after all it's the X1 not a TaX1 ! I hope if they the nerve to complain to 'First' they will be told just that ". The X2 continues to provide the odd Palatine with some revenue earning work. Today Malcolm saw 34156 on the 15.03 Lowestoft - Norwich. 37563 before departure from Yarmouth Caister Road this morning. Photo : D Speed. Most unusually neither 37569 or 37159 have worked since last Friday. This was the day that 159 blew up at Fransham with a charging fault, meanwhile 569 had a service and has been undergoing other maintenance. K17 saw 37576 failed with an adblue fault at lunchtime and the only spare bus was 37160 off servicing, so this worked forward. An accident at teatime saw services delayed on Guyhirn Bank. K18 didn't return past Bruce so may have gone empty to Lynn. 37578 on K19 was 22 late at 17.28. Possibly the shortest blog post ever ? 37569 returned to traffic on K4 today. 37565 had a day off for servicing. Diagrams 4, 5, 12 and 15 all changed buses at Lynn at some point today to enable servicing commitments to be fulfilled and for windows to be repaired. 37564 began on K4 but ended up on L12 and 37156 came in on L12 and was later K15. 37566 on K15 was 17 late westbound past Bruce at Walpole and was 23 late returning before 37156 replaced it for the 15.32 to Lowestoft. The X2 produced 34155 on the 10.10 ex Norwich and 34156 on the 15.48 departure from Lowestoft, both viewed by Malcolm while Michael Bryant reports Dart 43459 on the 13.38 to Norwich - the first seen for a while. Something odd happened late on tonight. Ian Wiseman had a call from his neighbour to say his X1 had broken down at Dereham. The next westbound service then went straight past and the following one allegedly turned round here to go back to Norwich. All very odd as nothing seemed amiss at the Lynn end. Only unusual thing was 37565 on L12 arriving at the depot at 22.45 (due 23.30) , so I am assuming this was the bus which broke down and it then didn't go to Peterborough at 20.50 as a result. 37576 had its adblue problem fixed and was out today on K4. 37572 was stopped for its MOT prep work at Lynn and 37160 had some paintwork tidied up at and was waiting to have new fleet number transfers applied to the front end tonight. 37564 on L8 had a headlight problem tonight, so 37573 replaced it on the late show, the 21.35 to Lowestoft. The service ran well today with ten B9s on the road, for the record 37563/5/8/9/71/3/5/6/8/9. This week has seen 37563/8/71/3/5/8/9 out every day. 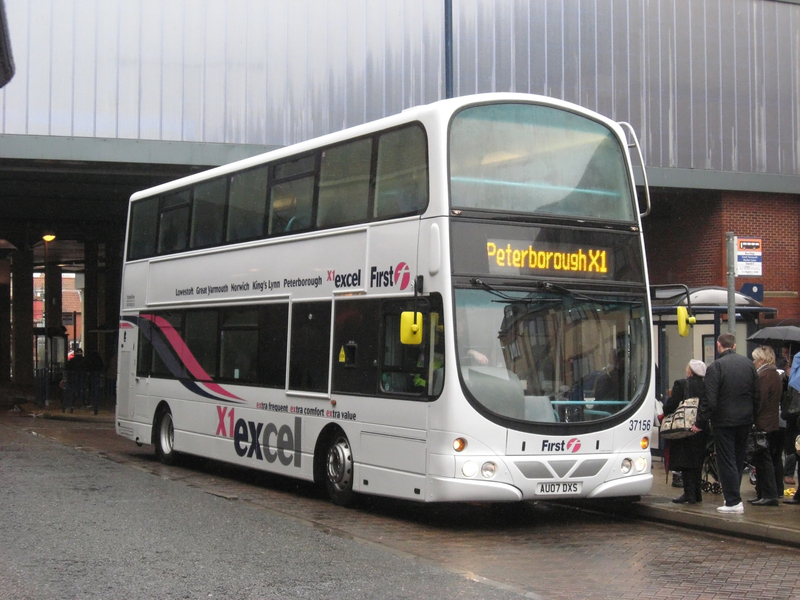 37575 is racking up the mileage again and has been out every day since 20th February. New advertising campaigns were being displayed today and these include the Harry Potter experience, Wrath of the Titans and less scarily Mini Ritz Crackers. Now if you wanted to attract the attention of the motorist sitting behind the bus, which of these two ads applied last weekend would you choose ? Well if you ask me,the bottom one is much more eye catching and as for the top one, well it is more eye testing ! .....as seen here on 37567. Finally tonight here's Andrew, one of the advert men who was a bit ritz crackered after the team had treated 500 buses in East Anglia today. Thanks to all those of you who continue to provide info for the blog, particularly Bruce, as I see very few daytime X1 services now. Things have really quietened down compared to a couple of years ago, so I guess I will probably continue with weekly updates unless anything spectacular happens. Looking back at this week, the following worked Monday - Saturday without coming off diagram which is impressive : 37563/71/75/77, 37157/58/60. In addition 37575 worked today (Sunday) too. Today's three buses spare - if you can call it that - were 37570 MOT, 37572 safety service and 37566 fuel fault. 37567 started out on K15, but tonight was in Vancouver Avenue. 37572 had replaced it at 15.32 but only reached Dereham where it failed being unable to restart. Earlier Des had been chauffeur on 567 when it had to drop off a poorly passenger at Gorleston JPH, this meant a 15 minute late departure, all of which had been made up by departure from Lynn at 12.45. 37156 photographed at a rather damp Market Gates this morning. Thanks to Grahame Bessey for the picture. 37564 had a peculiar day - it started on K2 but came off at 08.57 with an adblue fault and then after a break took Y6 11.02 Lynn to Lowestoft instead of 37578. Later 37578 was back out on K19 taking over from 37565 at 14.45. 37566 was repaired today and took over K2 from 37564 this morning. 37156 might look good, but apparently today it had no newspapers and no interior heating either. 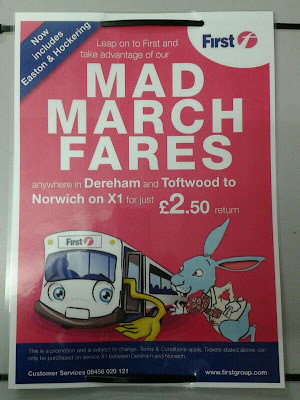 Rather worryingly there are plans for the X1 to call at all stops in Dereham and Toftwood from next month. There are currently four stops in both directions. This will increase to 18 westbound and 13 eastbound which sounds like a bit of a disaster for punctuality. 37564 in the Fens near Walsoken on L12 12.35 Peterborough - Lowestoft today. Y7 had 37572 swapped for 37568 at lunchtime and later 37572 was out again after 37567 had a broken window on K4. 37570 had its MOT today and the opportunity was taken at 17.45 to pop it onto Y6 so that 37579 could be released for servicing. Des writes, "37157 on L10 13.07 Southgates to Yarmouth - we should have refuelled at Vancouver Avenue but the entrance was blocked by a cement lorry, so refuelling was done at Lowestoft instead. Ten late from Lynn, but on time by Dereham. Caught up with 37576 on Y9 at Yarmouth at 15.30, so I took his Gorleston and Hopton passengers and he went direct to Lowestoft Tesco to make up time". Thanks to Richard Alger for sending this picture of 37156 this morning with a rather serious looking X1 driver !! Things were going well for a Friday today until an accident between Wisbech and Guyhirn caused disruption. K17, K18 & K19 were the services worst affected and there were vehicle swaps as a result. 37572 which came in to King's Lynn on Y7, the early finisher at 18.15 was then sent out to relieve 37159 which was in trouble at Little Fransham with a charging fault. I think 37572 then came back to Lynn on K19 instead of 37564. Malcolm saw 30889 on the X2 today, a recent reallocation from Yarmouth with 32211 going the other way. Syd says the other remaining President, 32210 is due to go to Yarmouth also in exchange for 30886 and 30887 will also go to Lowestoft with Palatine 34158 departing. Work inside King's Lynn garage is almost complete, but only one set of doors are available at the moment, hence the unusual parking of these B9s sideways on to the pits. 37577 is the only X1 vehicle retaining the Safehouse ad. Only one swap today, Y6 having 37573 taken off for 37565 forward. Timekeeping seemed fair and i passed ultra white 37156 on time on L12 heading east this afternoon. A quiet day although a Norwich City home match will probably have caused delays at teatime. 37566/7/8, 37570/2/4/5/6/8/9 were today's buses. Rather strangely Malcolm reports 37565 was spare in Lowestoft bus station all day. Des draws my attention to the Haven Bridge night closure which is due to last another month. 37570 in perfect conditions in Great Yarmouth today. Thanks to Des for the photo. Firstly an update on Sunday 25th and Des reports delays due to the football traffic in Norwich. 37574 on 15.30 ex Yarmouth was 10 late from Norwich, but 25 late by Easton due to the congestion. the service was 21 late into Lynn and 16 late departing on the 17.50 to Peterborough. Today was an uneventful day with no swaps. 37158, 37569 and 37156 out of service today at Lynn for servicing / noisy axle / MOT. Some buses fitted with new ads for the film 'Contraband' tonight. 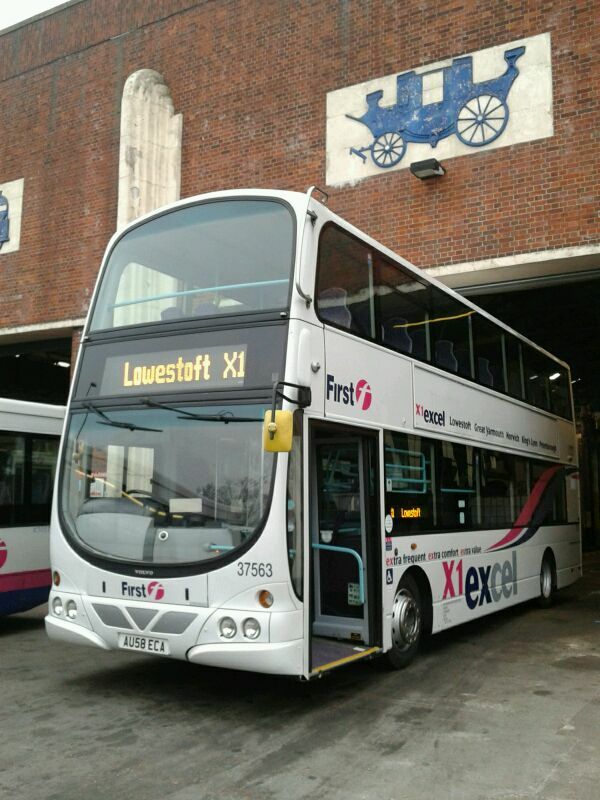 Des writes 'Today I had 37160 on L11 16.55 ex Lowestoft. We were on time until a road closure in Gorleston making us 5 late at the library, but on time by Yarmouth. Coming back from Lynn I was driving 37568 on L8 21.35 Lynn - Lowestoft. On time until the A47 closed at Longwater for roadworks. Came into Norwich via Dereham Road and Grapes Hill - thought I'd better then check the Newmarket Road stop as I was the last bus eastbound. 5 minutes late at Norwich bus station. At Yarmouth, Haven Bridge closed so diversion via Yarmouth/Gorleston bypass making us 8 late arriving at Gorleston JPH". A second successive day without incident. 37156 & 37569 still off the road but 37158 back freshly serviced and 37159 off today for same. Malcolm aw X2 vehicle 32655 operating a 101 town service in Lowestoft today. K5 had 37576 swapped for 37160 for the 10.32 Lynn - Lowestoft. 37578 was off the road for compressor attention, but 37569 was back on K4. Major delays caused by the closure of the Acle Straight this afternoon saw 37571 on Y6 depart King's Lynn almost 40 late on the 17.45 to Peterborough. A spirited run saw it back in Wisbech at 20.11 (16 late) and departing at 20.12 (12 late). It was on time at the Southgates at 20.40 heading east. Over at Lowestoft Y9 with 37158 arrived 25 late having been diverted via Filby and then departed 16 late on the 15.55 to King's Lynn. 37579 on L10 arrived in Lowestoft 45 late and then went light to Norwich to resume its duty at 18.05. 37567 on L11 arrived into Lowestoft -40 and departed 30 down at 17.25, the same time as the 17.25 X1 short to Yarmouth. The last bus to Yarmouth had departed at 16.10 ! Lynn arrival on L11 was 11 late at 20.10. 37572 became the first X1 Gemini to break the 400,000 mile barrier today. It passed the milestone at around 20.20 tonight between Eye and Thorney on L8. Delays were worse today, so nothing unusual there. 37572 was seen 10 late on K4 this morning, while L11 was 15 down with 37568. I saw Y13 13.05 ex Peterborough which was 37566 12 late departing Wisbech. 37158 heads east through Walpole Highway on K1, the 08.00 Wisbech - Lowestoft this morning. Nice to report a normal week at last. Every day this week K2 has done the following day's L8 which on Wed/Thu/Fri has then worked Y13. 37566/570 got a day off today so that they could be positioned for servicing on Monday. 37569 heads for Peterborough running about 12 late on K16 13.15 from King's Lynn today. Both 37159 and 37568 were kept at King's Lynn today with windscreen defects and this evening 37573 was taken out of service with some minor damage at the rear, it was replaced by 37160.